I want which product_id has been purchased the most for a particular month say aug. So, the query should return product ids and the no of times it has been purchased.I am getting stuck because of the two different product id has been purchased the same no of times, then what will be solution? 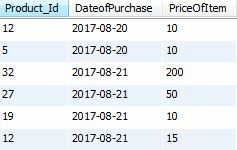 This Query is returning all the ids and their repetition times. I want only those id's that are maximum times purchased. If it is one then it returns one and if two it returns two.